Blog Why You Need to Improve Your Glide, The Key to a Better Start! Why You Need to Improve Your Glide, The Key to a Better Start! The swimming start is the fastest part of pool swimming. Unfortunately, many do not understand the various styles and phases of the swimming start, resulting in rushed, suboptimal starts [even research articles look at how to improve reaction time]. This article will delve into the glide and how to improve the glide. 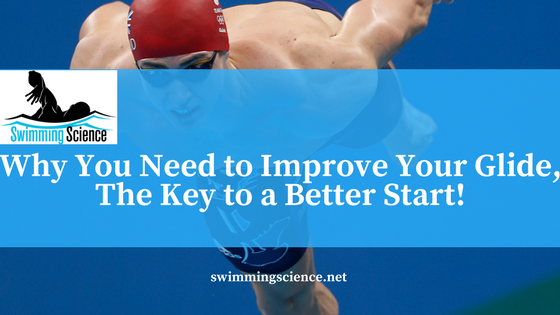 Many feel reaction time is the best spot to improve the swimming start, but little correlation exists between reaction time and starting ability. Instead, glide time is a modifiable variable which is gaining support and correlation with starting skill. Elipot is the swimming starts guru, luckily his team has researched starts. A recent study by Elipot et al. determined swimmers do not optimally use underwater kicking on their start. Elipot studied male swimmers (average 50-m free time 24.41) and determined swimmers initiate their underwater kick 1.69 m too soon. By kicking too soon, they did not succeed in producing higher velocities and wasted energy [read about elite swimming dolphin kicking]. Don’t work harder than you need to work! Swimming is hard enough, don’t make the sport any harder. In another study, by Elipot, he and his colleagues looked at the glide time of four French National-level swimmers. These researchers studied when the loss of underwater start speed occurred during the glide phase of the start. The swimmers reached a velocity between 2.2 and 1.9 m/s after their center of mass covered a distance ranging between 5.63 and 6.01 m from the start wall. 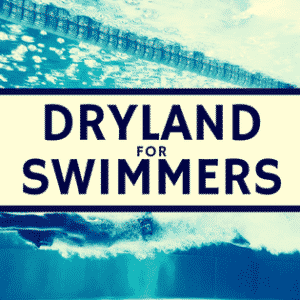 Instead of working on reaction time, concentrate on improving the swimmers gliding ability and glide length. Gliding ability appears to correlate with their ability to streamline, synergistically utilizing their knee, hip, shoulder, and core muscles. Glide length is a test of patience. 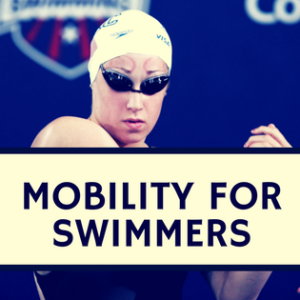 Many swimmers want to get up and race, using more energy than required without the associated increase in velocity. Elipot M, Dietrich G, Hellard P, Houel N. High-level swimmers’ kinetic efficiency during the underwater phase of a grab start. J Appl Biomech. Nov 2010;26(4):501-507. Elipot M, Hellard P, Taïar R, Boissière E, Rey JL, Lecat S, Houel N.Analysis of swimmers’ velocity during the underwater gliding motion following grab start. J Biomech. 2009 Jun 19;42(9):1367-70. Epub 2009 Apr 24. 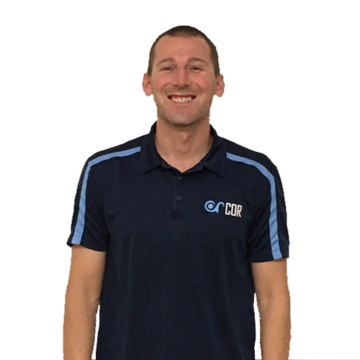 Dr. GJohn Mullen, DPT, CSCS is a World renowned expert and speaker in sports training and rehabilitation. He received his Doctorate in Physical Therapy at USC, as well as the Josette Antonelli Division Service Scholarship, Order of the Golden Cane, and the Order of Areté. 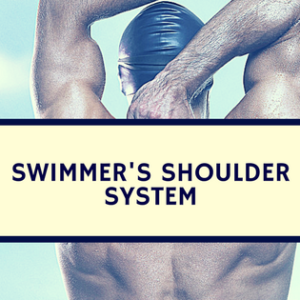 At USC, he also performed research on swimming biomechanics and lung adaptations in swimming training. Dr. GJohn has worked with multiple professional and Olympic athletes, helping them earn Olympic medals. He is also a sports performance consultant, working with the Chinese and Philippine National Teams. His dedication to research and individualization spurred him to open COR in 2011. Since 2011, Dr. GJohn has been featured in Gizmodo, Motherboard, Stack Magazine, Swimming World Magazine, Swimmer Magazine, USA Swimming, USA Triathlon, Swimming Science, and much more. He has worked with the numerous colleges and teams regarding rehab and performance. Before his Doctoral program, Dr. GJohn swam on an athletic scholarship at Purdue University. At Purdue, Dr. GJohn was an Academic Honorable Mention All-American and was awarded the Red Mackey Award and R. O. Papenguh Award. He also won the Purdue Undergraduate business plan and elevator pitch competition, as well as 1st prize with the Indiana Soy Bean Alliance. Dr. GJohn was born in Centerville, Ohio and was a 24-time high school All-American Swimmer. Dr. GJohn is still a swimmer and holds a Masters Swimming World and Pacific Swimming Record.